Look, up in the air – it’s a plane. Or a satellite. Or a drone. When you’re talking about Georgia’s aerospace industry, it could be any of those. The state ranks near the top in three main sectors: manufacturing aircraft, aircraft maintenance and, of course, air transportation. And although the industry may not get the broad recognition that other sectors (like agriculture or entertainment) do, insiders know. Aircraft and spacecraft are the state’s No. 1 export, and have been since 2004. Aerospace is the third-largest sector of manufacturing in Georgia, and global management consultants PwC named the state as the most attractive for aerospace manufacturing in its 2017 aerospace manufacturing rankings report. New sectors are emerging, too – especially unmanned aerial vehicles or systems (UAVs or UAS, commonly known as drones). 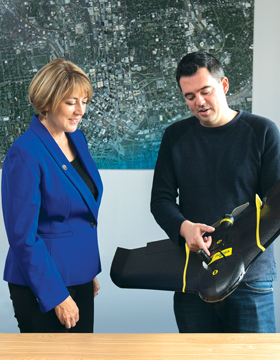 A 2015 economic impact study found that UAS companies in Georgia employed more than 600 people and were responsible for about $44 million in wages, according to Hudnall. The numbers are probably higher now, in part because of Airbus Aerial, a subsidiary of the French aircraft manufacturer, which launched its headquarters in Atlanta last summer. The aerospace industry isn’t limited to Atlanta. There are three other big clusters: Macon (centered around Robins Air Force Base to the south), Columbus (where Pratt & Whitney added 500 jobs earlier this year) and Savannah (home to Gulfstream). Gulfstream is getting ready to launch (almost literally) the G500 – a fly-by-wire airplane that uses electronic circuits rather than mechanical cables and pulleys to manipulate the flight controls. In fact, Gulfstream calls the system intelligence-by-wire, since it continually adjusts to keep the plane in peak aerodynamic condition. All of which translates to an extraordinarily smooth ride for the folks who will pay almost $45 million for a G500. The first ones fly off the assembly line in 2018. There are also companies like Thrush Aircraft in Albany, which recently added 100 jobs in Dougherty County. “The factory has been in Albany since 1965,” says Eric Rojek, vice president of sales at Thrush. “We manufacture the majority of the aircraft in-house … so when we grow we’re not just calling the vendor and asking for an additional supply of parts.” Rojek adds that all the jobs at Thrush are skilled labor jobs that pay well, and that the company has invested in training for both its employees and its customers with a full-flight simulator on site. Thrush makes agricultural planes and has stayed successful by diversifying its product line to offer aircraft for firefighting and patrol/surveillance for the military. While the agriculture line will always be at the company’s core, Rojek says diversifying helps smooth out the peaks and valleys that come with the agriculture business cycle. It also helps, he says, being located in Georgia, where the state understands agriculture as well as aviation, where there’s expertise in logistics and shipping and where the state’s Department of Economic Development maintains an international presence with offices in 11 countries. Thrush has partnered with the Georgia Center of Innovation for Aerospace to help with certification of some aircraft models, testing equipment and networking within the industry. “It’s an unbelievable resource as a manufacturer – especially for us, as a smaller manufacturer,” Rojek says. One of the major players in Georgia’s aerospace sector isn’t a business, but the university located in Midtown Atlanta with a global reputation: Georgia Tech. Tech’s programs extend beyond academia to private industry. Yes, it regularly turns out top talent – the president of Airbus Aerial is an aerospace engineering grad, for one – but it also works directly with companies in the sector through its Corporate Innovation Centers. Boeing has a long-standing relationship with Georgia Tech – the school is one of Boeing’s 10 “primary strategic secondary schools” that the company partners with on worldwide research. In June 2017, Boeing launched a manufacturing development center that enables company engineers to work alongside faculty and students to test new manufacturing technology almost at shop-floor scale, says Don McConnell, Tech’s vice president of industry collaboration. McConnell calls it a “righteous cycle” – ideas born in university research that then are tested as close to scale as possible, which allows for a much faster transition of new technology and knowledge when it comes time to move it to the real shop floor. One of the first projects is using industrial robots for machining and fabrication. The Boeing center is located within Delta’s Advanced Manufacturing Pilot Facility, a 19,000-square-foot center that opened on campus in 2017. It’s also designed to test physical and cyber manufacturing technology at near-scale – particularly, says McConnell, in the area of aircraft repair and engine refitting. Delta’s subsidiary, Delta TechOps, handles MRO for the company’s airplanes but also for third parties; it’s the largest airline MRO in North America and third largest in the world. “In the case of Boeing and Delta, hands-on manufacturing at scale is really one of the driving factors,” he says. Delta also has a global innovation center at Tech called The Hangar, launched in 2016, that focuses on “the rest of the business,” says McConnell: how the airline interfaces with passengers, how ground crews service aircraft, whether a wearable device could allow flight attendants and gate agents to communicate better, and whether drones can help inspect planes struck by lightning. Georgia’s connections between education and aerospace extend statewide through workforce development programs to meet the aviation industry’s needs. An aerospace task force established as part of Gov. Nathan Deal’s High Demand Career Initiative focuses specifically on aviation maintenance technicians and pilots, says Hudnall. Next year she predicts 11 colleges and career academies will offer aviation programs. Five technical colleges currently have FAA-certified courses in everything from aircraft structures to power plant (engines). Savannah Tech has specialty programs in airline upholstery and custom cabinetry needed by Gulfstream. And Middle Georgia State University is home to the only School of Aviation in the state as well as the Institute for Applied Aerospace Research. The broad nature of Georgia’s aerospace industry can be seen in announcements from two companies this past year. Lockheed Martin, whose plant in Marietta opened in 1951, got a contract option for $61.9 million to make its C-130J aircraft for the U.S. Coast Guard. The C-130, produced in Marietta, is a workhorse for the U.S. military, used for everything from combat to humanitarian missions, firefighting, search and rescue, refueling and special operations. The C-130J is a more technologically advanced version of the C-130. Also in 2017, the first LM-100J, a commercial version of the C-130J, rolled off the line. It had its first flight in May and debuted at the Paris Air Show three weeks later. Tony Frese, vice president, business development for Lockheed Martin’s air mobility and maritime missions (and another Georgia Tech grad), says that in its 60-plus years the Marietta plant has produced some of the most advanced aircraft out there, a run it’s continuing with production of the center wing assembly for the F-35 Joint Strike Fighter. “The type of products we produce in Georgia, it doesn’t get much more sophisticated than that,” he says. We may soon be saying the same about unmanned aerial vehicles – at least, if Airbus Aerial’s President Jesse Kallman has his way. The company leverages Airbus’ satellite imagery and combines it with the capabilities of drones to offer customers high-resolution images of everything from crops to power lines. It’s less about the vehicle than the data, Kallman says. “If you’re a commercial company looking to inspect power lines, pipe lines, look at cities after hurricanes, it shouldn’t matter what the data source is – it’s about solving the problem,” he says. The company recently worked with insurance companies in Texas and Florida to evaluate hurricane damage, using Airbus’ satellite imagery to triage the impact and then sending drones into areas found to have extensive damage. Another project with Southern Company used a similar combo to identify places where vegetation was encroaching on power lines. That one was also notable because the drones flew beyond the line of sight of the operator, which is a more challenging operation. Kallman considered starting the company in San Francisco but chose to open up shop in Georgia for a few reasons. These include easy travel to Europe (where Airbus is based), having an established UAV and aerospace community and being neighbors with potential customers.